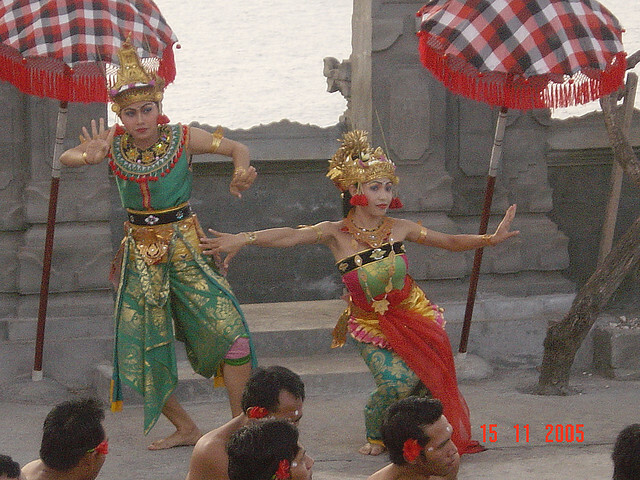 Kecak dance which is often called “The Monkey Dance” for the tourists in the form of dance drama is relatively new but has become a very popular show / famous and has become a must watch show for both domestic and overseas tourists. 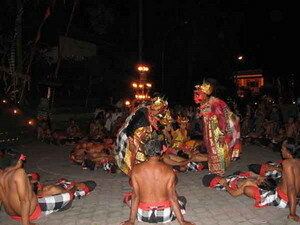 Kecak dance scenes have been promoted in several poscard, tourist guide and others. Kecak is the name is a name that is directly taken after the vote “smack, smack” in saying that constantly throughout the show. There are some who explain that the word or sound “cak” actually has a meaning that is very important and significant in the show. Not known for certain from where the dance originated and where kecak first developed, but there is a kind of agreement at the Bali community kecak first evolved into an art pertujukan in Bona, Ganyar, as additional knowledge kecak was originally a song or musical sound produced from a combination that form a melody that is usually used to accompany the sacred dances Sahyang. And can only be staged at the temples. Kemudaian astist in the early 1930s from the village of Bona, Gianyar trying to develop kecak dance by taking the story as a substitute didramatarikan Ramayana Dance Sanghyang so this can finally dipertontontan dance in public as the performing arts. Parts of the Ramayana story is taken when the first is where Goddess Sita was abducted by King Ravana.